The roof of your Bedford, TX home is one of the most important things in your life, but it is rarely given a close look. Problems often go unnoticed until something goes wrong. It is essential to know the primary causes of roof damage to generate awareness of what may create a potential problem. Here’s the top contributors to roof damage. Tree limbs that are within close proximity to your roof have the potential to fall during periods of high wind, heavy rain, and even snow. If the tree is weakened due to prior damage or disease, it is a ticking time bomb. Inspect the landscaping surrounding your home and remove any branches that pose a threat. Leaves, sticks, and pine needles can form build-up on your roof or in your gutters. This material soaks up moisture, leaving these areas of your roof constantly wet underneath, which causes shingles to deteriorate and the roofing structure to rot. Animals have the potential to cause a lot of damage to a roof. Birds, squirrels, raccoons, mice, and bats, all take part in pulling apart your roofing system. If you hear constant scratching or pecking, contact an exterminator to approach the problem. The primary purpose of gutters and downspouts are to channel water away from your roof. If they are poorly maintained or full of debris, water can back up and seep into the edges of your roof, causing rot. This common element can lift shingles, making even minor damage a big problem. If you notice a stray shingle or material on the ground after a storm, a professional such as Charles Martin & Son Roofing should inspect your roof. The sun’s UV rays have a big impact on your roof. Over time, shingles can dry out, crack, and even fall of, leaving your Colleyville, TX home with no protection. While UV damage tends to be common, it is also a sign that a roof may need replacing. Although all of these problems can cause damage to a roof, their commonality is that they can let moisture in. 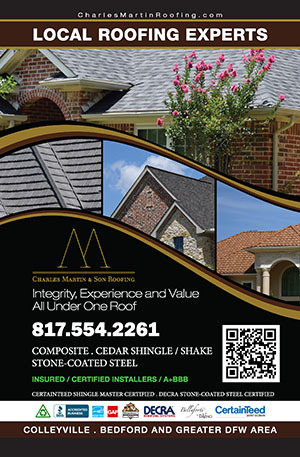 Contact a knowledgeable roofing contractor at Charles Martin & Son Roofing to conduct an inspection and identify potential weak areas.